It might have taken them three years to do it. 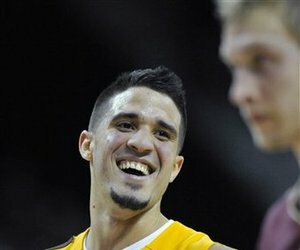 It might have been the last game for Grieves Vasquez to play at Comcast Center. And maybe it was not a game anyone would have predicted back in November. But any way, the University of Maryland Terrapins took control of their senior night game to overcome their rivals, the Duke Bluedevils, 79-72. The first 16 minutes of the game was in Maryland control. Vasquez had quite a few showboat moves that might not have been necessary, especially when Duke, as expected, went on a 12-2 run, closing the 14-point comfortable lead the Terps had—leaving the score at halftime 40-38 Terps. But that halftime locker room talk once again got the Terps going in the second half. Vasquez, with 20 points in his senior game; Sean Mosley, who’s shooting game was impeccable with 11-points; the freshman big man, Jordan Williams, unstoppable in the paint with 15-points and 11-rebounds; Adrian Bowie, with 9 points and didn’t miss any; all knew this was an important game, wanted the W, so they took it. The University of Maryland Terrapins are unstoppable. After a three-hour delay in Blacksburg due to a water main break after a van carrying beer to a party in an adjacent building backed into a fire hydrant, the Terps and Virginia Tech finally tipped off to a game that would need extra time to determine the winner; after two overtimes, it was UMD 104-100 over the Hokies, taking the game home. Greivis Vasquez‘s 41-points in the game and Eric Hayes‘ clutch 5 of 6 points of free throws in the final seconds of the game carried the Terps to victory and leaves their record at 21-7 ( 11-3 ACC). Nineteen ties, 15 lead changes, three last-second shots in regulation, two overtimes. This game was what college basketball is all about. Once again, UMD started off slow and was trailing 37-31 at halftime; even star player Vasquez only had 8-points as he followed his teammates into the locker room. And once again, after the second half began, the Terps proved they deserved to be on the top 25 and that they should not be an underrated team. Was it something said in the locker room? Or the jeers from the Hokies directed at Vasquez who yelled “USA!” at the Venezuelan native when he was at the free throw line. 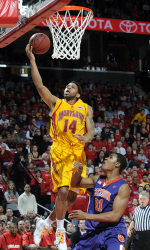 Or maybe the Terps just like to toy with their opponents in the first half. Whatever it was, Vasquez with 33 points in the second half and Sean Mosley‘s 17 points (six of which came in the second overtime) helped turn the game around in the second half and beyond as the teams fought neck to neck all the way into double overtime to determine the winner. Those last few seconds in regulation time were edge-of-your-seat-excitement seconds. After that big Cliff Tucker buzzer beating shot on Saturday night, did Maryland still have that magic to carry them to another win against Clemson tonight? In what was a back and forth battle, the Terps proved that they have what it takes to overcome their opponents, even when it is an uphill fight, as they defeated the Clemson Tigers 88-79 after a 15-point deficit. The first half of the game was nothing to remember: the Terps played sluggishly and you could tell that Greives Vasquez was tired. With some of their key players in foul trouble early on in the game; like freshman standout forward Jordan Williams, and their other two top rebounders, who had already acquired two fouls before the end of the first half, this game didn’t look pretty. At halftime, the Terps were lucky to only be trailing by nine points as they went into their locker room with the score 48-39. Would the Terps find that ‘magic’ and turn this game around and beat the team that overcame them in late January?